Product prices and availability are accurate as of 2019-04-19 08:16:41 +08 and are subject to change. Any price and availability information displayed on http://www.amazon.com/ at the time of purchase will apply to the purchase of this product. 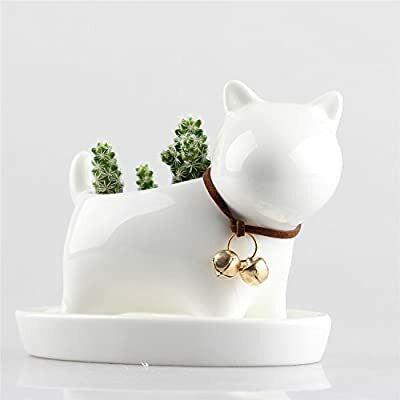 Decorative small planter pot designed to look like an adorable animal, rabbit, cat, dog sheep, elephant. A contemporary clean look, this white ceramic flower pot will add a beautiful touch to your living space. Perfect for succulent, moss, fern and cactus plants. Plant not included. Made of ceramic materials, high quality. Ivory white or milky white available. Can be also bused as pen holder.